Margarets In Town (formerly Darby Park Serviced Residence) Designed for all who appreciate quality, guests are offered a range of well appointed studio, one,two and three bedroom fully serviced apartments. Hotel Amenities Reception service 7 days a week, from 7.30am until 7.00pm. Heated swimming pool, free WiFi,BBQ facilities, exclusive lounge bar, family entertainment room, half court tennis and secure parking. The property also offers pantry shopping, breakfast packs, restaurant charge back, conference and secretarial facilities. Guest Rooms Standard Rooms are hotel style rooms. Apartment features include a fully equipped kitchen, with full size oven and dishwasher, laundry facilities, spacious living area and balcony. 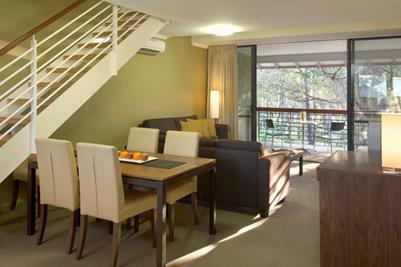 Additional conveniences include reverse cycle air conditioning, in room safe, CD/ DVD player and Foxtel viewing. Relax in a superb Studio room (hotel style), which has a king size bed, with the ability to convert into two king single beds. (If you require the bed to be split, please advise before arrival). The ensuite bathroom has a shower over the bath and each Studio has a private balcony, with views of the beautiful State Forest or the outdoor pool. Facilities include a private electronic safe, desk, remote control television with Foxtel services, DVD/CD player, tea and coffee making facilities, toaster, a microwave, ironing facilities and reverse cycle air conditioning. Breakfast baskets and pantry shopping services are available on request. 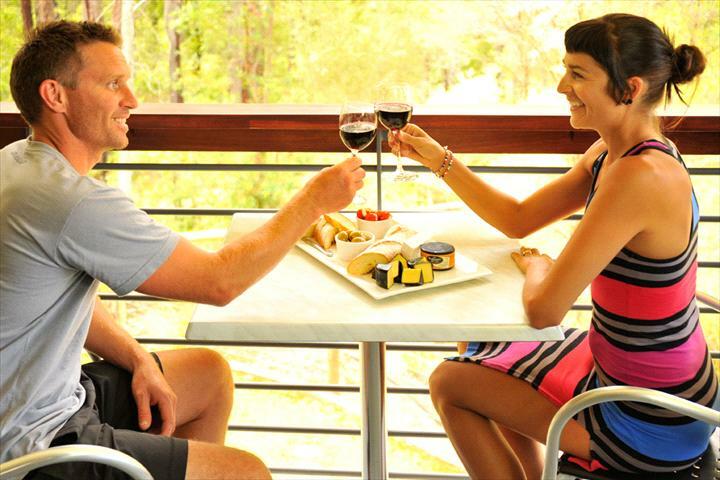 Two night stay minimum over peak periods. Plenty of space, ideal for the family, our Two Bedroom Apartments, which are upstairs, consist of the Master bedroom, with a king size bed, a mezzanine loft which has 2 king single beds and a double sofa bed in the living area. The bathroom has a shower and spa bath and the kitchen is fully equipped with an oven and gas cooktop, dishwasher and microwave. The laundry includes a washing machine, dryer and ironing facilities. 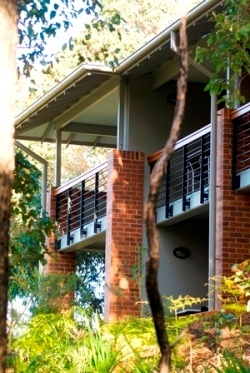 The living area looks out onto a private balcony, with views of the State forest or the outdoor pool. Facilities include complimentary WiFi, a private electronic safe, desk, remote control television with Foxtel services, DVD/CD player and reverse cycle air conditioning.